Russia’s new status as a pivotal nation in the Middle East’s security environment, accompanied with the American withdrawal and the rise of ISIS, is pushing Israel and Egypt to rekindle their relations. As Jerusalem wants to retain its status of an oasis of stability amidst surrounding volatility and Cairo is struggling to re-establish itself after the post-Arab Spring fiasco, Russia’s involvement in the region serves as an additional stimulus for these strange bedfellows. The Kremlin’s military campaign in Syria has successfully preserved Bashar al-Assad’s regime and saved Syria from slipping into the Libyan chaotic scenario. Moreover it is evident that Russia’s military bases will further augment country’s influence in the Mediterranean Sea and entire Middle East, allowing Moscow to actively participate in the regional security setting. Interestingly, unlike during the Cold War, Moscow is now seeking to build strong relations with all major players of the region including Israel. Putin shares warm relations with both the Israeli Prime Minister and the Egyptian President. In effect, Netanyahu has visited Moscow three times more than the White House for the past year, and al-Sisi’s regime is looking forward to have Russia’s state nuclear giant Rosatom construct the country’s first nuclear power plant in El-Dabaa. In addition to their friendly relations with the Kremlin, Israeli and Egyptian leaders also share great relations with each other. Israel has earlier returned to Egypt two sarcophagus as a sign of good relations between the two nations. Israeli Foreign Ministry Director-General Dore Gold told Reuters: “The return of the Egyptian (artefacts) is symbolic, more than anything, of the changing relations (between) Israel and Egypt.” Moreover, despite a direct violation of the peace treaty of 1979 terms, Israel did not object transfer of the Islands of Tiran and Sanafir to Saudi on April 9. As Israel remains the most stable nation within the region and the Egyptian economy heavily relies on Saudi help, both countries are interested in benefiting economically from enhanced cooperation. In particular, both Cairo and Jerusalem cooperated in removing obstacles to a multibillion-dollar natural gas deal, as Israel was close to settling a $1.73 billion fine that Egypt was ordered to pay, a move that could further encourage discussion of exporting Israeli offshore gas. Cooperation between Israel and Egypt is also augmenting due to coinciding interests in terms of regional security and balance of power. Israel and Egypt were alarmed by the spread of transnational jihadi groups such as ISIS and initiated one of the strongest network of intelligence gathering, which was highlighted by the IDF’s deputy chief of staff. Security in the Sinai peninsula has also become a vital issue for both nations. Egypt could also help to resolve Israeli-Palestinian issue and Gaza’s blockade. Israel and Egypt are discussing possible territorials transfers that would allow Egypt to establish a corridor to Gaza. 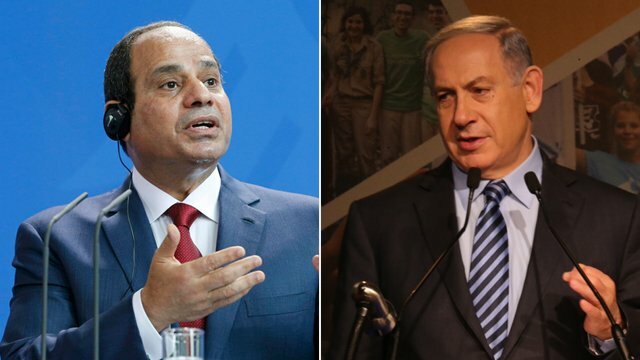 Furthermore, Sisi is reportedly trying to bring Israeli and Palestinian leaders to Cairo for an Egypt-led peace summit. Cairo might also hold old Ottoman grudges against Turkey’s ambitions for the region and Sisi would not want to cooperate with Turkey since it supported the rise of the Muslim Brotherhood. Thus, Cairo would rather seek cooperation with Israel within the current regional setting and try to alienate Ankara for as long as possible. Therefore, considering the current rapprochement between Israel and Turkey, Netanyahu will have to be more cautious while seeking to retain same level of relationships with Egypt.